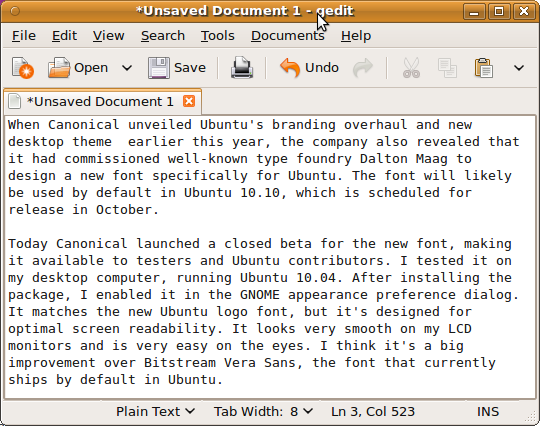 It is great Canonical have noticed default rendering of Bitstream Vera Sans in Ubuntu is not good, however this new font is not good either. 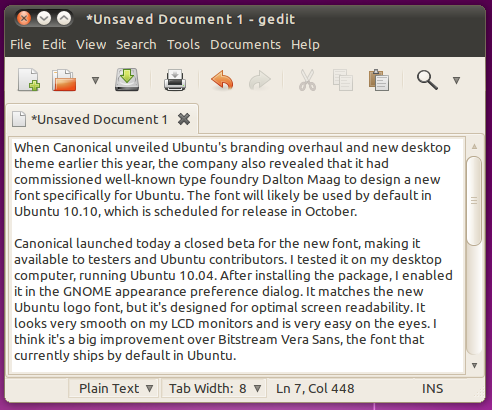 There is a much easier way to get nicer user interface font in Ubuntu without any new font(s). Just go to System/Preferences/Appearance, and set Hinting to Slight and Resolution to 94 dots per inch. IMHO much much nicer compared to default DPI/smoothing settings in Ubuntu and much nicer compared to future "Ubuntu font". Mozilla Firefox and Thunderbird will emit somewhat larger fonts. To fix this for Firefox, put attached userContent.css into ~/.mozilla/firefox/*/chrome folder; to fix this for Thunderbird, put attached userChrome.css and userContent.css into ~/.mozilla-thunderbird/*/chrome folder.